And last time we asked: How can we tell a pre-1600’s thimble from a later thimble? Well, as with most things historical, there is not a fool proof test. But knowing the facts about when thimbles are likely to have arrived in an area and the appropriate form of the thimble does help. If you are in the market for historical thimbles, usually found by metal detectors, and someone tells you that they have an absolutely lovely Roman thimble that was found outside of London, don’t buy it. Their information is not correct. That doesn’t mean that it might not be a nice Medieval thimble, but the general consensus, repeated by the Museum of London, says that thimbles were first used in England in the 1300’s. There is also no good archaeological evidence that the Romans used thimbles. Earlier reports of thimbles in Pompeii are incorrect. 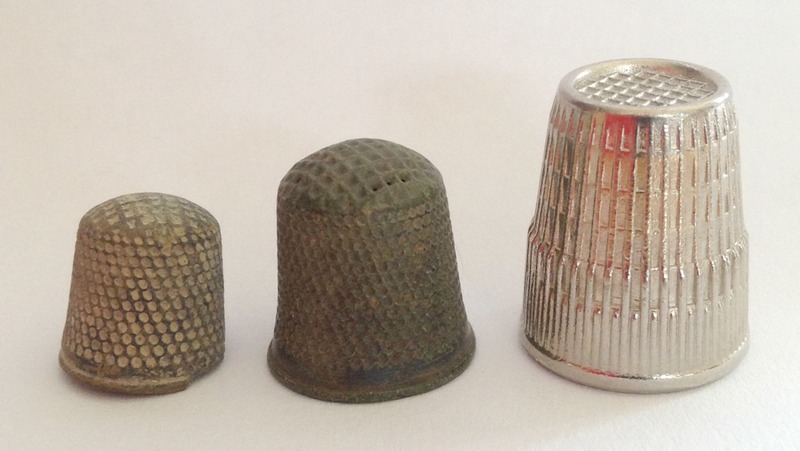 Now of course, we are talking about metal thimbles. and could this analysis change at a future date due to better quality analysis of well-dated archaeological sites? Yes, of course, but currently that is our best guess. Another problem that we have is that thimbles continued to be made, by hand, using the same techniques that were used during the Middle Ages, right down to modern times. So especially in places, like the eastern European countries, where there is a tradition of local metal workers, thimbles could be made as part of their wares. Probably the most noticeable sign that a thimble was made post 1600, is what I call a “waffle top”. 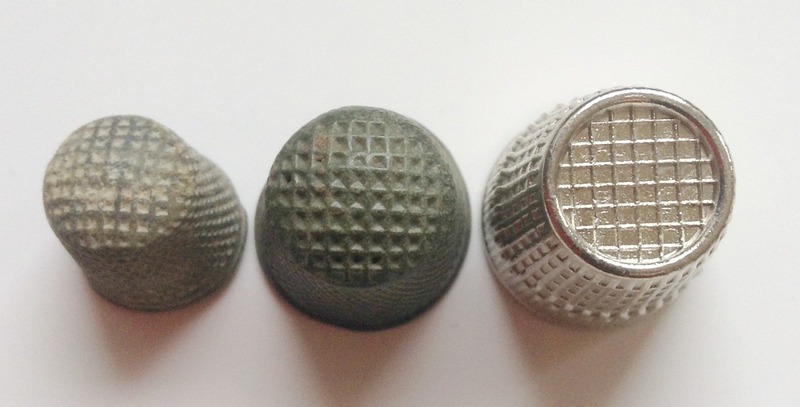 If you look at most modern steel thimbles, which are created in large presses, the top of the thimble is covered with a perfect grid, almost like a waffle. This picture shows exactly the sort of patterns that I mean. The outsides of these thimbles are also covered with a perfectly symmetrical set of complex dimples or textures, just like in these examples. Steel needles may have appeared, in China, before the first century BC, but that doesn’t mean that iron or steel was being used to make thimbles. The vast majority of pre-1600 thimbles were made from pewter, a copper alloy (bronze, brass, or latten), or silver (mostly late 1500’s). Iron thimbles began to be produced in about the 1400’s in the Middle East, but they were fairly uncommon in England until the 1700’s. The first thing I do when I buy a “batch” of thimbles is to check the tops for a “waffle” top, and the second thing I do is whip out a kitchen magnet. Anything with a “waffle” top, or that sticks to a magnet goes in the “modern” bucket. Now obviously there are lots of really gorgeous modern thimbles, but generally that is not what I am looking for. So now we have an idea of what was going on in Europe, but what about the areas of Middle Eastern and Slavic influence, that were actually closer to the source of silk? This entry was posted in Metal Casting, Metal Working, Thimbles and tagged brass thimbles, bronze thimbles, iron thimbles, latten thimbles, Medieval Thimbles, modern thimbles, pewter thimbles, steel thimbles by Eirny. Bookmark the permalink.